To implement this functionality, called file change notification, a program must be able to detect what is happening to the relevant directory on the file system. One way to do so is to poll the file system looking for changes, but this approach is inefficient. It does not scale to applications that have hundreds of open files or directories to monitor. The java.nio.file package provides a file change notification API, called the Watch Service API. This API enables you to register a directory (or directories) with the watch service. When registering, you tell the service which types of events you are interested in: file creation, file deletion, or file modification. When the service detects an event of interest, it is forwarded to the registered process. The registered process has a thread (or a pool of threads) dedicated to watching for any events it has registered for. When an event comes in, it is handled as needed. The WatchService API is fairly low level, allowing you to customize it. You can use it as is, or you can choose to create a high-level API on top of this mechanism so that it is suited to your particular needs. Create a WatchService "watcher" for the file system. For each directory that you want monitored, register it with the watcher. When registering a directory, you specify the type of events for which you want notification. You receive a WatchKey instance for each directory that you register. Implement an infinite loop to wait for incoming events. When an event occurs, the key is signaled and placed into the watcher's queue. Retrieve the key from the watcher's queue. You can obtain the file name from the key. Retrieve each pending event for the key (there might be multiple events) and process as needed. Reset the key, and resume waiting for events. Close the service: The watch service exits when either the thread exits or when it is closed (by invoking its closed method). WatchKeys are thread-safe and can be used with the java.nio.concurrent package. You can dedicate a thread pool to this effort. 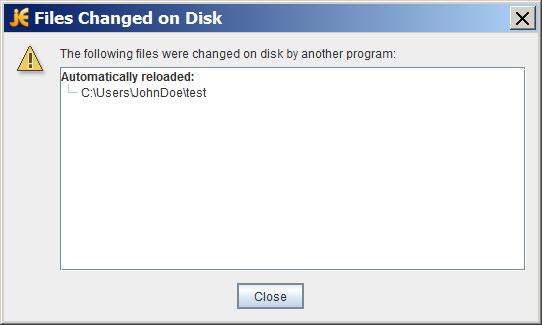 Play with creating, deleting, and editing files in the test directory. When any of these events occurs, a message is printed to the console. When you have finished, delete the test directory and WatchDir exits. Or, if you prefer, you can manually kill the process. You can also watch an entire file tree by specifying the -r option. When you specify -r, WatchDir walks the file tree, registering each directory with the watch service. Next, register one or more objects with the watch service. Any object that implements the Watchable interface can be registered. The Path class implements the Watchable interface, so each directory to be monitored is registered as a Path object. ENTRY_CREATE – A directory entry is created. ENTRY_DELETE – A directory entry is deleted. ENTRY_MODIFY – A directory entry is modified. OVERFLOW – Indicates that events might have been lost or discarded. You do not have to register for the OVERFLOW event to receive it. poll – Returns a queued key, if available. Returns immediately with a null value, if unavailable. poll(long, TimeUnit) – Returns a queued key, if one is available. If a queued key is not immediately available, the program waits until the specified time. The TimeUnit argument determines whether the specified time is nanoseconds, milliseconds, or some other unit of time. take – Returns a queued key. If no queued key is available, this method waits. Process the pending events for the key. You fetch the List of WatchEventsfrom the pollEvents method. Retrieve the type of event by using the kind method. No matter what events the key has registered for, it is possible to receive an OVERFLOW event. You can choose to handle the overflow or ignore it, but you should test for it. Retrieve the file name associated with the event. The file name is stored as the context of the event, so the context method is used to retrieve it. After the events for the key have been processed, you need to put the key back into a ready state by invoking reset. If this method returns false, the key is no longer valid and the loop can exit. This step is very important. If you fail to invoke reset, this key will not receive any further events. Ready indicates that the key is ready to accept events. When first created, a key is in the ready state. Signaled indicates that one or more events are queued. Once the key has been signaled, it is no longer in the ready state until the reset method is invoked. The process explicitly cancels the key by using the cancel method. The watch service is closed. Here is an example of an event processing loop. It is taken from the Email example, which watches a directory, waiting for new files to appear. When a new file becomes available, it is examined to determine if it is a text/plain file by using the probeContentType(Path) method. The intention is that text/plain files will be emailed to an alias, but that implementation detail is left to the reader. // are lost or discarded. // context of the event. //  file is a text file. // Resolve the filename against the directory. // the resolved name is "test/foo". // the directory is inaccessible so exit the loop. Note: Email.java uses unchecked or unsafe operations. If you are unfamiliar with the @SuppressWarnings syntax, see Annotations. The Watch Service API is designed for applications that need to be notified about file change events. It is well suited for any application, like an editor or IDE, that potentially has many open files and needs to ensure that the files are synchronized with the file system. It is also well suited for an application server that watches a directory, perhaps waiting for .jsp or .jar files to drop, in order to deploy them. This API is not designed for indexing a hard drive. Most file system implementations have native support for file change notification. The Watch Service API takes advantage of this support where available. However, when a file system does not support this mechanism, the Watch Service will poll the file system, waiting for events.